The middle school years are not only important for your child’s academic development, but also for their social and physical maturation. This is why at Brillantmont we provide first-class sport facilities for our students. The hours spent studying and learning in the classroom are balanced with fun physical activities such as tennis, basketball, trampolining, and swimming. These school sports engage the students in new and exciting ways. Brillantmont requires students to take sports classes as part of their schooling schedule and we make an effort to keep the options diverse and exciting. We want to be sure that the children can try many different types of sports in their time at the school, broadening their exposure and sparking new passions. In addition, interacting with other students in team sports and while having fun together learning new physical skills, allows for the children to make friends easily and build strong connections in our school community. At the heart of our campus we have a new sporting facility, the Francoise Frei-Huguenin Sports and Cultural Centre, that opened in 2012. 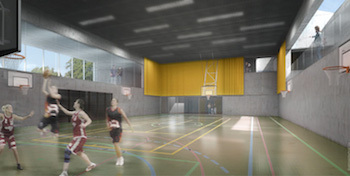 This building provides space for sports including badminton, unihockey, circuit training, gymnastics, basketball, handball, volleyball, football, high jumping, juggling, and free weights. In addition we have a viewing gallery, music studio, and a performing arts stage integrated into the centre. Aside from these facilities on our school campus, we also take advantage of what the local area has to offer. For example in the spring and autumn students enjoy, mountain biking, track and field, and swimming in an indoor pool nearby or in the lake. In the winter season we go cross country skiing or ice skating. Through this diverse offering of sport activities utilising exceptional facilities both on and off campus, your middle schooler is able to explore many forms of physical expression that is essential in their overall development. By providing them an environment where they are exposed to not only a diverse academic palette, but also many extra-curricular activities, students are able to easily blossom into their full potential.